I hurt my knee last week so I've not done much. It was just yesterday that I've started to go out to places other than relatives' homes, and my cousin's medical practice. My big adventure for the day was to get dropped off at the Lima International Book Fair after lunch at Toti and Marina's. Normally, I hit the book fair a couple of times and can easily spend a couple of hours there on each visit. This time, however, owing to my knee issues, I zipped through only stopping at a handful of stands, most of which I had already decided on visiting anyway. 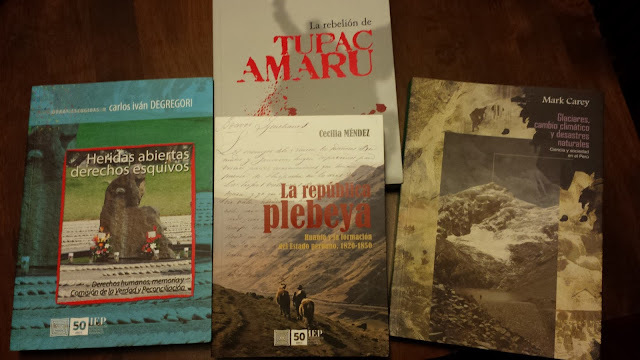 In fact, I only delved in depth into two of them --those of the Istituto de Estudios Peruanos and of the Instituto Frances de Estudios Andinos-- and I only bought books at IEP's.